LG announced its Google Home integration back in May, but at the time only a few models from its Signature line of appliances was compatible with the Assistant. LG is expanding this list now to 87 WiFi-connected refrigerators, ovens, dishwashers, washing machines, dryers, vacuums, air purifiers, A/Cs, and more. 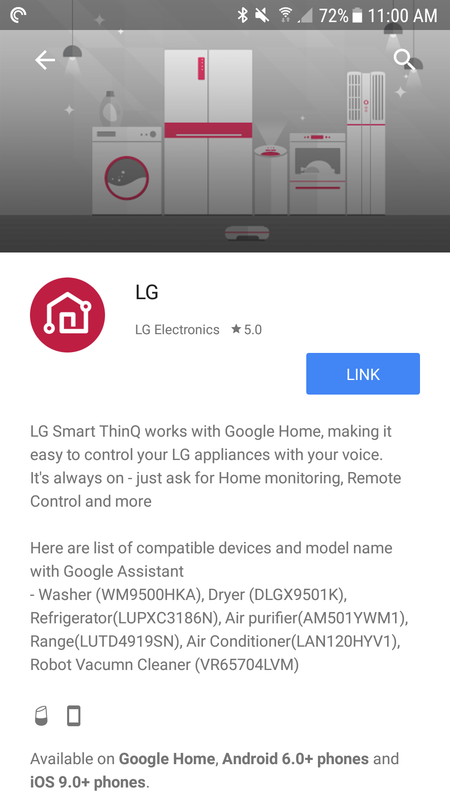 The integration first requires your appliance to be set up through the LG SmartThinQ app (wow, terrible ratings), and then you have to link that to your Assistant. LG isn't a first-party partner yet (it's not in the Home Control section like Hue and Nest), so you'll have to search through Assistant's integrations (blue icon on the top right when launching Assistant on a phone) to find it. The list of compatible devices is expanding to 87. Once you've linked LG to Assistant, you'll be able to preheat your smart oven before reaching home, check the remaining time on the washer or dryer, tell your fridge to make more ice, change your A/C settings, check the air quality, and more. LG also says it supports multiple users so it can tailor its actions to you, though I'm confused about how that would work: do different users need different SmartThinQ accounts (does a single appliance even support being linked to more than one SmartThinQ account?) or does the SmartThinQ app support multiple users (doesn't seem like it). Anyway, if you're interested and you were already thinking about purchasing a connected LG appliance, you might want to wait a couple of weeks. Between October 8 and 25, LG will be offering one free Google Home per household with the purchase of a qualifying model. Check the promo page for the full list of smart appliances. ENGLEWOOD CLIFFS, N.J., Sept. 26, 2017 /PRNewswire/ -- Driving home its commitment to future-ready open platforms for smart appliances, LG Electronics USA today announced that almost 87 Wi-Fi connected LG smart home appliances – including washing machines and dryers, refrigerators, ovens, dishwashers, vacuums, air purifiers and more – are now compatible with the Google Assistant on Google Home and eligible Android and iOS smartphones. With the industry's most extensive range of smart appliances available today, LG is offering consumers more ways to control their home and enjoy the benefits of a connected home experience, ushering in cutting-edge connectivity and convenience and expanding the Google Assistant compatibility and functionality for LG smart appliances announced earlier this spring. To encourage consumers to experience firsthand how smart appliances can enhance their daily lives at home, LG is offering a Google Home U.S. retail promotion this fall. From Oct. 8-25, anyone who purchases a Wi-Fi-enabled LG appliance will receive a free Google Home* device. The retail promotion is available nationwide and will help bring the smart home experience to more consumers. LG smart appliance owners can now have the Google Assistant help them around the house with their connected LG appliances. For example, they can use simple voice commands from anywhere within range of the Assistant on Google Home (or on their smartphone) to check the time remaining during wash cycles on their washing machine, tell their LG refrigerator to make more ice, turn off their range after cooking, adjust thermostat settings on their LG air conditioner, and even check the air quality level in their home using their LG air purifier. The Assistant on Google Home can also distinguish one voice from another, so it can be personal to just you. Setup is simple and convenient with the free LG SmartThinQ app, available for Android or iOS. With just one app, users can control the entire lineup of LG smart appliances. Whether it's preheating the oven on the way home from work or checking the remaining laundry time while at the gym, LG makes managing smart appliances easy. Taking connected convenience further, LG SmartThinQ learns about a consumer's usage patterns and helps predict their needs. The more a consumer uses LG smart appliances, the smarter the appliances get. By using adaptive technology to interpret usage habits and data, LG smart appliance will know when to alert you it's time to order filter refills in their refrigerator or air purifier, and it can troubleshoot lint build-up in their dryer – all through the LG SmartThinQ app. LG makes it easy for consumers to connect and interact with Wi-Fi built into virtually all of its 2017 appliances. Committed to its Open Partnership, Open Platform, and Open Connectivity strategy, LG is building a smart ecosystem with an expansive connected appliance lineup that includes products for the kitchen, laundry room and throughout the home with air conditioners, vacuums and more. In addition to Google, LG's Open Partnerships include others such as Amazon to meet the needs and preferences of smart home adopters. "At LG, we're making smart simple so consumers can enjoy all the convenience today's connected home can offer without the hassle," said David VanderWaal, vice president of marketing, LG Electronics USA. "Gone are the days of constantly checking on your laundry cycles or wondering if the kids left the refrigerator door open. With new ways to control your home, a future-ready open platform, and the most extensive range of connected appliances available today, LG smart appliances will change the way you think—and the way you live—for the better." *One per household. Terms and expiration apply. LG Electronics USA, Inc., based in Englewood Cliffs, N.J., is the North American subsidiary of LG Electronics, Inc., a $48 billion global force and technology leader in home appliances, consumer electronics and mobile communications. LG Electronics sells a range of stylish and innovative home appliances, home entertainment products, mobile phones, commercial displays, air conditioning systems and solar energy solutions in the United States, all under LG's "Life's Good" marketing theme. For more news and information on LG Electronics, please visit www.LG.com.